For more than 100 years, Birkett safety relief valves have been installed to protect process plant and equipment from the potentially disastrous effects of exceeding a design pressure. Birkett offers a range of safety relief valves to suit most application requirements. 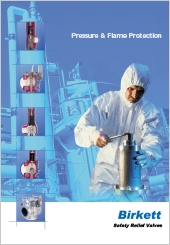 WB Series - Full lift, full nozzle, conventional or balanced bellows valves with dimensions to API526. Safeflo - Gas or liquid thermal relief valves. Safeset - Pilot operated safety valves with a unique full nozzle design and dimensions to API 526. Pop and modulating pilots are available for both gas and liquid duties.